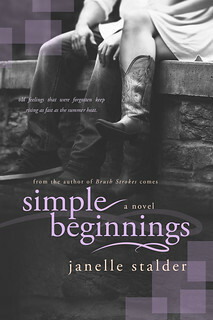 Today is the cover reveal for Simple Beginnings by Janelle Stalder. Ella Page planned to spend her summer before college like most girls her age – shopping, tanning, swimming, repeat. Instead she finds herself helping out on her grandma’s farm, where she is forced to work side by side with her ex-best friend, Gage Hunter. Despite her attempt to stay cool around the boy she no longer feels like she knows, the heat in the summer air just won’t stop rising. And with it, old feelings she’s not so sure were forgotten after all. * 17+ Mature YA / New Adult. This book contains some strong language and sexual situations. For mature audiences. You can add Simple Beginnings to your to-read list on Goodreads. I like how the feel of this cover matches the first cover in this series, only with a different colour accent. I wasn’t a big fan of the first cover and I am not a big fan of this second cover either. I don’t know the cover looks old somehow? It just doens’t give me a nice feeling. It also reminds me a bit of literary novels with that “a novel” so prominently on the cover. I don’t know it jst doesn’t work for me. I do like the picture they choose for this cover, how you can only she the shoes of the characters and nothing else. I prefer to not see a model’s faces on the cover, so this works for me. But in general this is just a meh, okay cover for me. Janelle Stalder was born and raised in Brampton, Ontario. At an early age she developed a love for literature. Her debut novel, Eden, was the first book in a series of four, released in September of 2011. Since then she has released an Adult Dystopian Romance series, the New World Series, hitting the best sellers list on Amazon. She has also released a Mature YA/NA novel, Brush Strokes, that stayed on the best sellers list for contemporary romance for sixteen straight weeks. She is a strong supporter of other independent authors, and loves to interact with her readers. When she’s not writing, Janelle is at home with her husband, two children, Aiden and Elora, her little bun in the oven that is on the way, and her two furry children, Alice and Lily. She now resides in a small town in Ontario in her old, possibly haunted, century home. Definitely a cute cover! I especially love the black and white tone. I’ll have to add it to me to-read list! The black and white tone seems to be a trend for NA books, but I like it! I agree the picture works, but beside that I am just not getting the wow feel. It’s just a bit meh. Just like you I like it when series have cohesive covers, when in one look you can see it’s a series. I do like the picture used, but indeed the colours make it look so old. Maybe if it was in colour it would’ve worked better? But a lot of NA’s are actually in black and white, but for this cover it doesn’t work for me.